We’re very proud to announce that Tim Brooks, one of our Certified Volkswagen Technicians, recently achieved the prestigious Volkswagen Master Technician designation. Reaching the highest level of Volkswagen Certification doesn’t come without tremendous dedication and effort; Tim endured hundreds of hours of training and succeeded in his final evaluations. His course load equated to over 45 full days of learning the unique ways that Volkswagens are built, maintained and repaired. There are currently 942 registered VW techs in Canada, and of those, only 105 have reached the Volkswagen Master Technician level. We’re extremely pleased to have Tim on our team and we’re sure his profound knowledge and skill set will benefit the operations of our entire Service Centre. 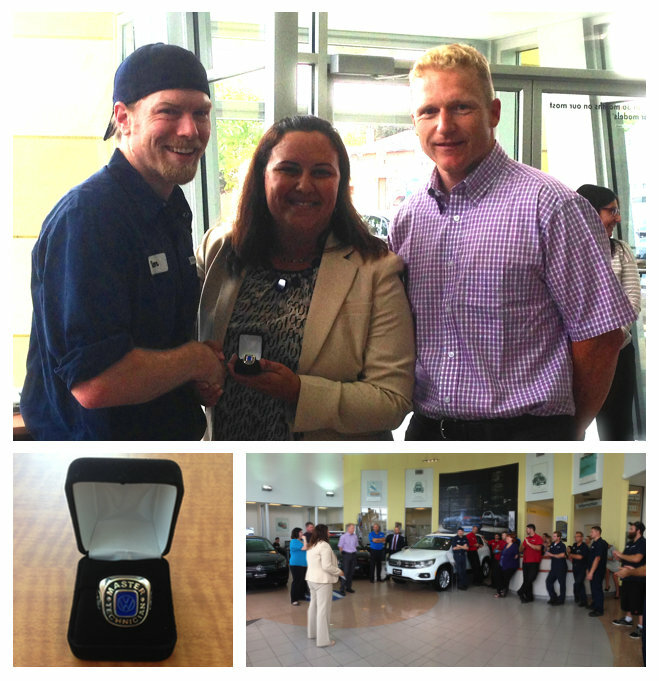 Just recently Tammy Vigna – our Fixed Operations Manager, and Ingo Schnuelle, Technical Quality Manager, both from Volkswagen Group Canada, made the trip down to Kitchener to commend Tim and presented him with a special VW Master Technician ring. Congratulations from the whole Crosby family Tim! Photo from left to right: Tim Brooks, Tammy Vigna, Ingo Schnuelle.